Oh yea! First I would like thank my friend sandy for nominating me for the #WashBucketChallenge. I was not surprised why he nominated me to this challenge. Because he knew that I hate to do the laundry and always ask my wife to do it. I believe many men out there hate doing laundry and think that it’s the women job and they are supposed to do the same. But time has moved on and men and women equally #sharetheload. It is not only the earning in all the way by cooking, laundry, cleaning house. In one word it is totally a homemaking. I have a wonderful wife and as her better half it is my love and duty to support her in everything. As my job demands working late she always supported doing all the daily chores. 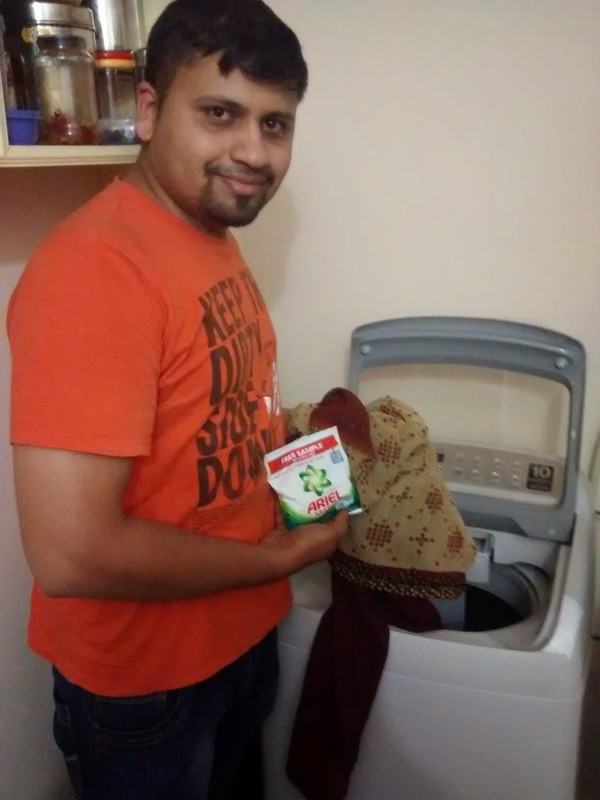 This #WashBucketChallenge gave me a chance to #sharetheload when I received the Ariel Matic wash powder. I made up my plan and wanted to give her a surprise. Today being Sunday I get up little late my wife and her sister who stay with me they already left to mass. As I wanted to surprise her I got after they left and took #WashBucketChallenge. When you have the best power in hand it is not only women job any one can do the laundry. I called up my friend who live nearby to take some pics for this post. He was well surprised by the way I am doing it, inspired and willing to take up this #WashBucketChallenge. 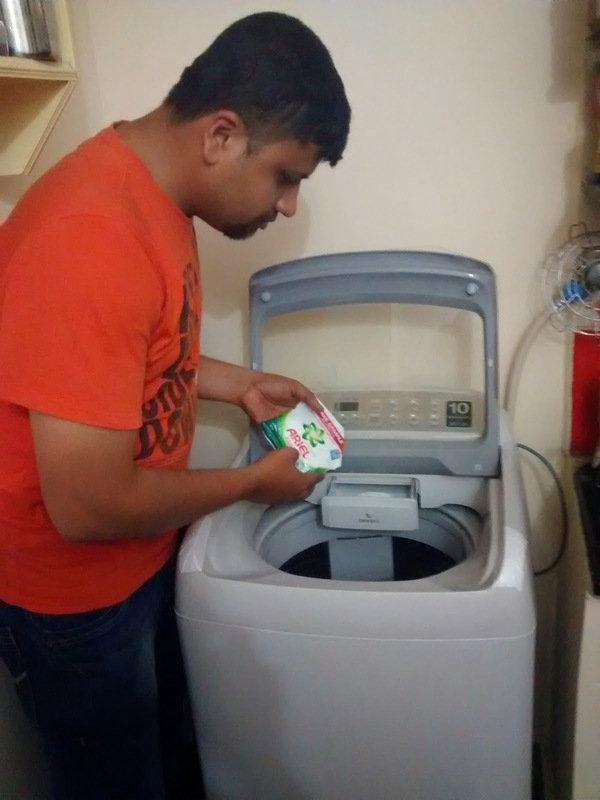 Here is the simple way to the Laundry with Ariel Matic Wash powder. Put all the cloths in the machine, Add the Ariel Matic Wash Powder and turn on the machine. It will just take your 45 minutes. I did not wait 45 minutes in front of the Machine. I went to the kitchen and prepared breakfast for all of us. By the time I finish preparing the breakfast my clothes were ready clean and dry to be hang out. While taking out form washing machine I dumb struck for a moment. I have no idea that Ariel Matic wash powder will do this magic. Clothes were like new. I thought there is no easy way than this. By the time I finish hanging the cloths my doorbell rang. I opened the door. I just took her in my arms and brought her inside. She was in confusion what has happened to me. She saw my friend on the couch greeted him and went inside to see what has gone wrong. She saw the breakfast prepared on the dining table and the cloths were washed and hung outside the balcony. I could see the surprise in her face and joyful tears in her eye. 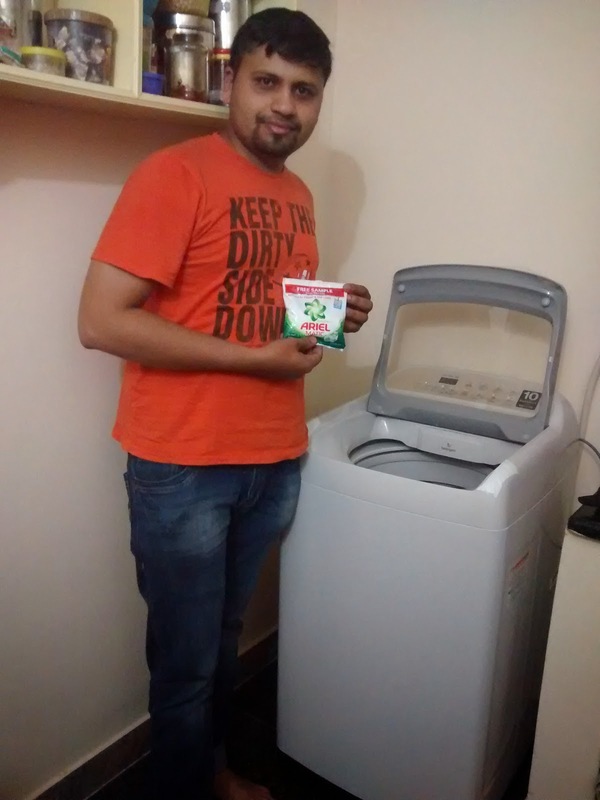 Thanks to #WashBucketChallenge and Ariel Matic wash powder giving me a wonderful moment of my life. Labels: BlogAdda, Breakfast, Homemaking, WashBucketChallenge.